The pantry has been experiencing a sort of revival in popular modern architecture. More and more homeowners are adding pantries to their existing homes, or requesting them to be added to new construction. Pantries are a great way to add extra storage space to your kitchen without removing any valuable counter space. The most prominent feature of any pantry is the door naturally. Since your kitchen serves as a gathering point for your friends and family, you’ll want your pantry door to add a touch of style and design to your kitchen’s aesthetic. Choosing the right pantry door is the key. 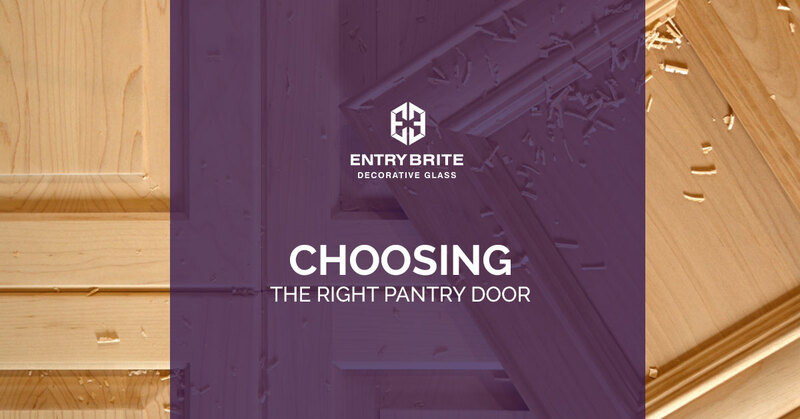 Entry Brite in Las Vegas will discuss some of the most common pantry doors so you can decide which one is right for your kitchen. Along with the pantry, barnhouse doors have become a popular design feature for owners to incorporate into their homes. Barnhouse doors are perfect for kitchen pantries that are short on floor space. The sliding mechanism means that the door moves to be flush with the wall, not swinging out where it could be interrupted by an errant chair or guest. These doors look great in homes that are going for a rustic aesthetic, or a minimalist appearance. A simple addition to your existing pantry door, adding a chalkboard, or painting it with chalkboard paint creates a fun place to keep notes, recipes and more. You can plan out menus, write out a grocery list, or even just provide your young ones with a place to get creative and create artwork. You can apply chalkboard paint to the exterior and interior of your pantry doors for added note-taking space. Pocket doors are a kind of sliding door that can be hidden within the wall next to it. When you open a pocket door fully, they sit flush with the edge of the door frame, making them unnoticeable. They save more space than traditional hinged doors, and you can use either a single or double door depending on the effect you’re trying to achieve. Pocket doors can be found in a variety of sizes, styles, and materials so you can find the perfect match for your kitchen pantry. A classic choice, and one that likely came pre-installed onto your pantry. Panel doors are common in houses today and are just made up of square panels of wood. These doors are attractive in their own right, hence their common use and enduring appeal, but are not the most visually enticing option. You may consider replacing this door with something else. These doors make use of a variety of mediums to create interesting visual patterns. Some just replace the wooden panels in the door with glass inserts. This allows light to filter into the pantry as well as allowing you to peer into your pantry without having to open the door. The use of glass helps to brighten your kitchen space. Entry Brite also offers glass and wood doors that make use of features like beautiful stained glass and wrought iron to create elaborate patterns within the door itself. Ultimately, choosing the right pantry door comes down to your sense of style and taste. No matter what you chose, each of these doors can be painted, finished, or distress to match the other decor in your kitchen. If you’re looking to add a timeless and elegant touch to your kitchen, turn to Entry Brite to find a custom pantry door for your home. Made from high-quality leaded glass and iron, we offer four unique designs, and even custom design options. Contact us today to schedule a visit to our showrooms or to speak with a pantry door designer.